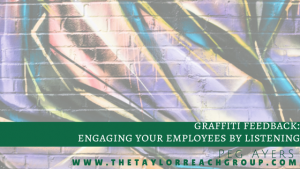 Graffiti Feedback: Engaging your Employees by Listening | The Taylor Reach Group Inc.
You know how time moves faster when holidays are coming up, and you have a huge to-do list? It was that time for me about 15 years ago when I realized I hadn’t figured out the holiday parade theme for my Contact Center. In our small city in the hills of West Virginia, we were the largest private employer. Our participation in the parade, which took place around Thanksgiving, was nearly mandatory. What do you want our parade theme to be? 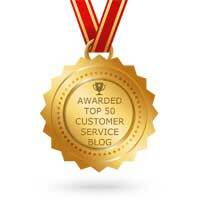 I received some good answers, we chose one of them, and many of our 600 employees participated enthusiastically. But in addition to parade ideas, I received something I hadn’t expected. A few people had thoughts on things they’d like changed, and they wrote them anonymously on my holiday poster board. I had a robust open-door policy, and I was out on the Contact Center floor visiting with people every day, so why were they writing on the board? It seemed there was an appeal to making suggestions through anonymous graffiti. So I answered them on that same board so everyone could see my replies. Changes you’d like to see? Please write them here and I’ll respond. No need to sign your name. One of the most notable features of kaizen is that big results come from many small changes accumulated over time. However, this has been misunderstood to mean that kaizen equals small changes. In fact, kaizen means everyone involved in making improvements. Peg’s Page was kaizen at its most basic: Frontline people articulating obstacles to optimal employee engagement and customer experience, and senior leaders removing those barriers. Over the years, the firm saved many thousands of dollars as a result of improvements originated on Peg’s Page. Even ideas without direct payback had benefits, in better morale, more effortless customer experience, a more comfortable place to work. In later years, Peg’s Page moved into the 21st Century, and the comments and responses were available online for all to read. But I never gave up getting the original suggestions on paper and responding to them there. If people want to be anonymous, there’s nothing like a blank sheet of paper with a marker attached. Sometimes my response was just “Come see me please” because the issue needed a face-to-face discussion. Often I was answering a question from one that was in the heads of many. Always I was showing the front-line people that they mattered. The Peg’s Page feedback loop led to kaizen: many small changes accumulated over time. It did this by getting feedback directly from those most involved and affected. Always go to the source. At The Taylor Reach Group, we have years of experience going to the source to improve employee engagement, customer experience, and process. Please contact us to learn more!